As we move closer to the first week of October and our Autumn renovations I think its a good time to outline the process of works we will be undertaking. Firstly, why do we cause all this disruption to the greens? The simple answer is that we need to in order to continually improve the greens. We recently had the greens tested for organic matter (thatch) content, with the results coming back with a surprise. The greens I expected to have the higher organic matter content, such as the 2nd and 4th that are predominately the wetter greens actually came back with the lower percentage. In general the percentage of organic matter we have in the greens is too high with recommendations being between 2.5%-3%. The results above show that all the greens require work to bring the percentages down to within recommendations but that they are not excessively high with exception of the 13th, I feel this is an encouraging result. With this in mind we have set out the following works to be completed as part of Autumn renovations. We will verticut the greens to a 2mm depth. This has been an excellent tool throughout the season to help refine the putting surfaces, creating less resistance on ball roll and greatly increasing greens performance. Verticutting before applying large amounts of sand helps integrate the sand into the grass sward producing smoother surfaces. Then we will verti-drain the greens using an 18mm solid tine aiming for maximum depth of 250mm (10inches). This helps to relieve compaction in the sub soil and also creates drainage channels from the surface down past any compaction which further aids drainage. A heavy topdressing will then follow that will be brushed down into the holes created. The more sand we can move down into the tine holes, the longer those drainage channels will remain open below the surface aiding drainage. The next stage in hollow coring with a 13mm hollow tine to a depth of 100mm (4inches). Whoever said you have to break eggs to make omelettes was clearly talking about hollow coring. It’s disruptive, time consuming, damaging to turf grass health and takes longer to recover than any other form of aeration….. BUT the benefits are undeniable in terms of organic matter reduction,drainage and the transferral of material to the sub soil. This is why courses all over the world use this method and why we will continue to do so until we have our organic matter content within target range. Another heavy topdressing is then applied and brushed in aiming to fill as many core holes as possible. At this stage we aim to apply the most topdressing because the bigger holes allow for a larger volume of sand which will firm up the greens but also improve the build up of the sub surfaces. The final stage is to finish with the verti-drain using a 13mm solid tine to a maximum depth of 250mm (10inches). This creates even more drainage channels but with the added benefit of closing up the previous tine holes from the bigger 18mm solid tine and 13mm hollow tine. This greatly aids recovery and should see the surfaces return to their normal standards quicker. During the period that we will be carrying out the work, some winter greens will be in use and we thank you for your patients during this time. Over the last 2 weeks the weather has been fantastic and the course is starting to take shape nicely. Last week saw the team carrying out several operations, to continue building towards quality putting surfaces. We were able to verti-cut, cut, top dress, brush and roll. The application of small amounts of sand, at more regular intervals, during the season will play a big part in better greens performance throughout the year. The more sand we integrate into the surfaces, the better the greens will receive a ball being pitched in. Integrated sand also helps to breakdown organic matter which will further improve greens performance. At the beginning of last week we also changed the way that we cut the semi rough, previously both the fairways and semi were striped, which reduces definition between the two heights. When standing on the tee box it should be clear what is the intended target and what is semi rough. With the new 9 holes still relatively young and generally lacking defining features such as established gorse bushes or mature trees like the old 9, cutting the semi half and half will frame the striped fairways, creating more definition. 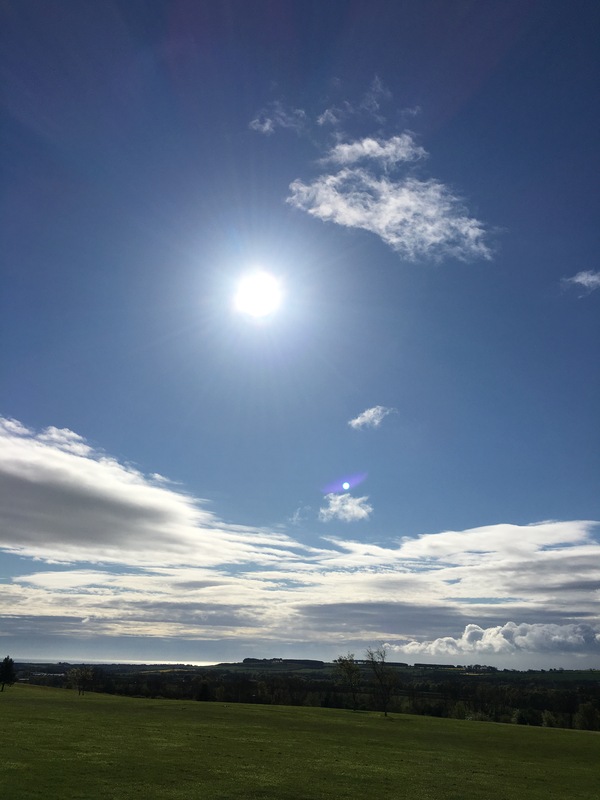 The photos on the website show that during the summer the fairways are a real feature of the course and using the semi to frame them will further enhance this. It may take a little time to really pop but the picture below is what we are aiming for. Moor Allerton Golf Club’s 23rd hole. One of the perks of getting up early and working out on the course is seeing all the wildlife that make our course their home. It is something that I will continually look to increase over the years and any sightings of wildlife, I am always happy to hear about. A friend of mine Chris Espiner from Ponteland GC donated 6 bird boxes which last week I installed out on the course. To help create awareness of the boxes and any activity, I thought we could have a little competition. The first member that personally tells me the location of all 6 bird boxes on the course I will put £20 behind the bar for them to enjoy a few drinks. Good Luck and hopefully we will see them being used shortly. This week has seen the fabulous weather with little to no rain continue, meaning that the greens have been placed under heat stress. The lack of cloud cover has meant the sun was out in full force evaporating moisture from the ground. This weather has highlighted that we lack of a fully functional irrigation system. This has meant that this week we have been maintaining the greens for health instead of performance. We have reduced the use of the greens iron, sarel spiked and applied a spray consisting of wetting agent and seaweed. In spite of our efforts greens 16 and 18 have been overly dry resulting in a drop in performance, however on Friday I managed to get a system in place that allows us to hand water the greens. Since hand watering on Friday, Saturday and Sunday the greens health has bounced back. With the weather set to continue, drought and heat stress management will be paramount but a very welcome challenge. 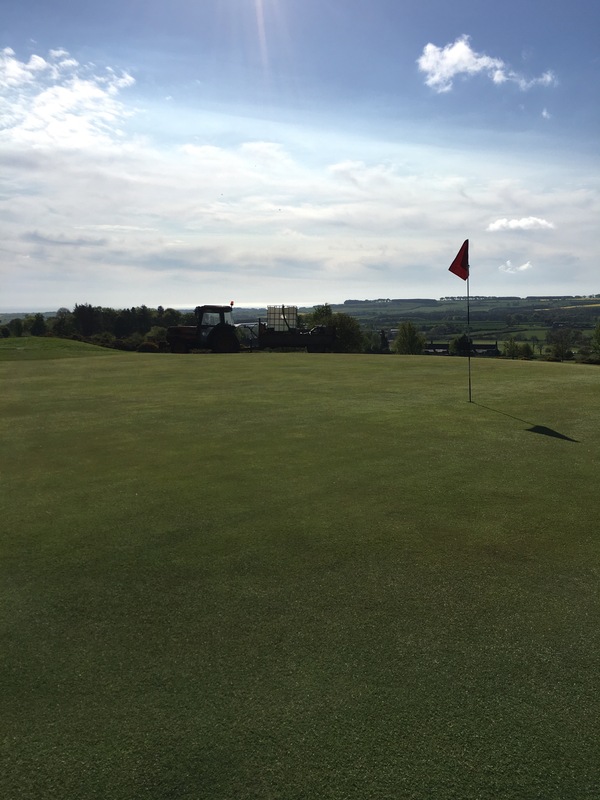 The recent weather has allowed an insight as to how firm the greens will become during the summer, making them difficult to stop a ball on. Actions we will be taking to help alleviate this problem are to firstly start a wetting agent program on the greens. This means applying wetting agent on a monthly basis, so that it is continually working towards maintaining a consistent moisture level within the upper subsurface. When moisture is in short supply the wetting agent retains it, and when moisture is in abundance it aids in the movement down through the subsurface. A more consistent moisture level means more consistent performance and a more consistent bounce. Secondly we will continue to apply small amounts of sand topdressing during the season and then a larger amount down aeration holes at the seasons close. We use a United States Golf Association (USGA) approved topdressing that has been tested for infiltration rates, particle size and compaction so that it performs perfectly for the use in golf greens. Having this top dressing integrated into our greens will further improve the performance. Lastly the control of organic matter is very important, as during the summer it drys out becoming hydrophobic, repelling water and creating a firm layer that decreases chances of stopping the ball on the green. 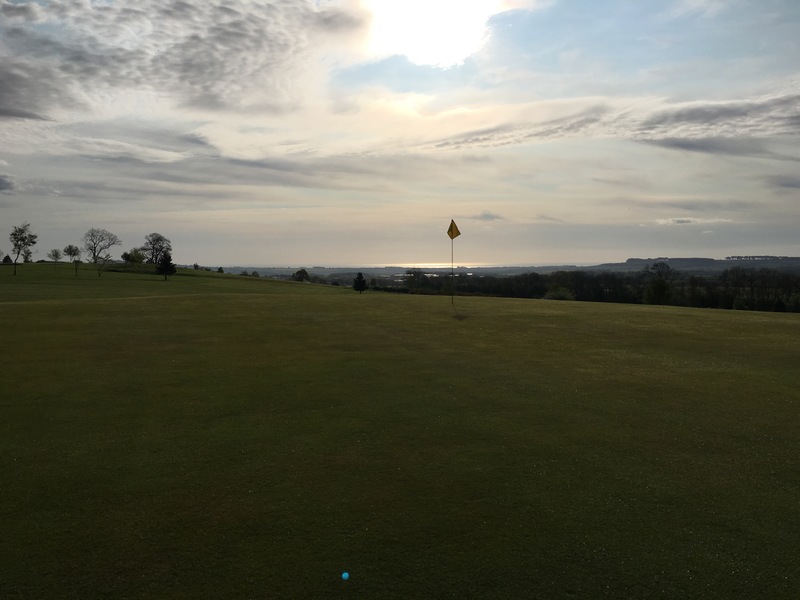 We will continue to manage organic matter by monitoring the amounts of fertiliser we apply, top dressing, verti-cutting and aerating during the season and hollow coring in the Autumn. Hello to the members of Alnwick Castle GC, my name is Jack Hetherington and having completed 10 years of service at Ponteland GC I have just completed my first day at Alnwick. The few members that I have met so far have been extremely welcoming and as positive as the course management team I am now working with. Firstly I must say how excited I am to be working on such a beautiful course, I was very surprised at the hidden gem we have when I first walked the course leading up to my application for the role. I relish the opportunity to have an impact here as we work together towards a better course. I am extremely indebted to Stuart Tait who has set excellent standards of presentation as well as laying fantastic foundations for us to build and improve on. He has left me some mighty shoes to which I will endeavour to fill and I wish him and his new family all the best for the future. Im sure all of you that played over the weekend will have been cursing the rain we have had and the soggy course it has left us with. From my point of view it couldn’t have came at a better time, it has further highlighted to me areas that need addressing before the season gets fully underway. It has also demonstrated the course’s bounce back capability once that rain does stop. I was dubious about being able to get out and cut the greens but they have recovered enough and took a cut well. If you have been out playing today you may have notice that we have been out with the Verti-Drainer, I appreciate that its a sight not many like to see but the recent rain has highlighted that greens 2, 3 & 4 are struggling to keep pace with the rest of the course in terms of drainage performance. These 3 greens will be receiving a little extra treatment before we build towards the season ahead. We have aerated them using our biggest tines at maximum depth, we will now apply as much sand as possible working it down the holes to create drainage channels that will continue working well into the season. Again thanks to Stuart’s care for the course these greens are in great health which will speed up recovery of the surfaces and reduce disturbance to play. To further help reinstate playing surfaces, this week will see the arrival of a demonstration greens turf iron. This is an essential piece of machinery in the maintenance of sports turf surfaces and hopefully we will all see a difference in the greens following its use. An approach I have had success with in the past with regards to turf irons is to move away from buying a heavy roller in the search of increased greens speed but actually opting for a light weight roller that can be used throughout Autumn, Winter and Spring as opposed to the heavier rollers that certainly on our course would only come out during the Summer. The turf iron we will be using this week is lightweight, nimble and quick meaning in Summer we can double roll to push on for speed but also use during the wetter seasons for a bigger impact on performance for more of the year. Hopefully I will be seeing you out on the course soon and if not happy golfing.